Cash on hand at December 31, 20__ was $_________. The carrying amount of the (city/county/district’s) deposits, including certificates of deposit, was $_________ and the bank balance was $________. Custodial credit risk for deposits is the risk that, in event of a failure of a depository financial institution, the (city/county/district) would not be able to recover deposits or will not be able to recover collateral securities that are in possession of an outside party. The (city/county/district’s) deposits and certificates of deposit are mostly covered by federal depository insurance (FDIC) or by collateral held in a multiple financial institution collateral pool administered by the Washington Public Deposit Protection Commission (PDPC). Investments are subject to the following risks. Interest Rate Risk: Interest rate risk is the risk the (city/county/district) may face should interest rate variances affect the fair value of investments. The (city/county/district) does not have a formal policy that addresses interest rate risk. In addition to the interest rate risk disclosed above, the (city/county/district) includes investments with fair value highly sensitive to interest rate changes. Credit Risk: Credit risk is the risk that an issuer or other counterparty to an investment will not fulfill its obligations. The (city/county/district) does not have a formal policy that addresses credit risk. Custodial Credit Risk: Custodial credit risk is the risk that, in the event of the failure of the counterparty, the (city/county/district) will not be able to recover the value of its investments or collateral securities that are in the possession of an outside party. The (city/county/district) does not have a formal policy for custodial credit risk. Concentration of Credit Risk: Concentration of credit risk is the risk of loss attributable to the magnitude of an investment in a single issuer. The (city/county/district) does not have a formal policy for concentration of credit risk. Foreign Currency Risk: Foreign currency risk is the risk that changes in exchange rates will adversely affect the fair value of an investment. The (city/county/district) does not have a formal policy for foreign currency risk. The (city/county/district) is a participant in the Local Government Investment Pool was authorized by Chapter 294, Laws of 1986, and is managed and operated by the Washington State Treasurer. The State Finance Committee is the administrator of the statute that created the pool and adopts rules. The State Treasurer is responsible for establishing the investment policy for the pool and reviews the policy annually and proposed changes are reviewed by the LGIP advisory Committee. Investments in the LGIP, a qualified external investment pool, are reported at amortized cost which approximates fair value. The LGIP is an unrated external investment pool. The pool portfolio is invested in a manner that meets the maturity, quality, diversification and liquidity requirements set forth by the GASBS 79 for external investments pools that elect to measure, for financial reporting purposes, investments at amortized cost. The LGIP does not have any legally binding guarantees of share values. The LGIP does not impose liquidity fees or redemption gates on participant withdrawals. The Office of the State Treasurer prepares a stand-alone LGIP financial report. A copy of the report is available from the Office of the State Treasurer, PO Box 40200, Olympia, Washington 98504-0200, online at http://www.tre.wa.gov. The (city/county/district) is a participant in the (county investment pool), an external investment pool. The (city/county/district) reports its investment in the Pool at the fair value amount, which is the same as the value of the Pool per share. The responsibility for managing the pool resides with the County Treasurer. The Pool is established from the RCW 36.29 which authorizes the County Treasurer to invest the funds of participants. The (county’s) investment policy is established by the [describe (i.e. Finance Committee)] consisting of the (describe Committee members and objectives). The county external investment pool does not have a credit rating and had a weighted average maturity of __ years as of December 31, 20__. Level 3: Unobservable inputs for an asset or liability. The city/county/district should briefly describe the types of investments authorized by legal and contractual provisions. If there are material violations of these provisions, they should be disclosed. 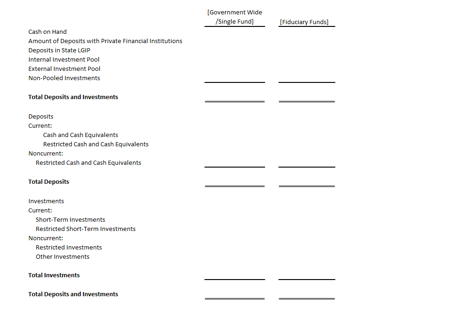 If the types of investments authorized for different funds, fund types, or component units differ significantly from those authorized for the primary government and those funds, fund types, or component units have material investment activity compared with the combined primary government activity, the difference in the authorized investment types should be disclosed. The city/county/district should also disclose its own policies that are related to risks. If a city/county/district has no deposits or investments policy that addresses a specific type of risk that it is exposed to, the disclosure should indicate that fact. This disclosure is required for a primary government as a whole. Risk disclosures should also be made for governmental and business/type activities, individual major funds, nonmajor funds in aggregate, or fiduciary fund types when the risk exposures are significantly greater than the deposit and investment risk of the primary government. Disclosures should distinguish between the primary government and it’s discretely presented component units. The financial statements should make those discretely presented component unit disclosures that are essential to fair presentation of the basic financial statements. Disclosure is limited to types of investment held at year-end. [1A] If the city/county/district has bank balances subject to custodial credit risk, provide a brief description of its deposit policies related to deposit custodial credit risk or state that it does not have a deposit policy for custodial credit risk. Disclose only that portion of the total bank balance that was subject to deposit custodial credit risk. If no bank balance was subject to deposit custodial credit risk, do not include a discussion of deposit custodial credit risk in Note 2. [1B] If the city/county/district has balances subject to foreign currency risk, provide a brief description of its policies that are related to foreign currency risk or state that it does not have a policy for foreign currency risk. Disclose only if the city/county/district has deposits denominated in foreign currency. Disclose the U.S. dollar balances of such deposits organized by currency denomination. If there are no deposits denominated in foreign currency, do not include a discussion of foreign currency risk for balances. If the city/county/district does not have any investments exposed to risk identified below, delete risk description. Risk disclosures applicable to investments should be reported separately by investment type. Dissimilar securities should not be aggregated into a single investment type. Disclose custodial credit risk for investments only if unregistered/uninsured securities are held either by the counterparty or by the counterparty’s trust department or agent, but not in government’s name. Governments should disclose the credit quality ratings of external investment pools and other pooled investments of fixed-income securities. If the investment is unrated, the disclosure should indicate that. 1.Credit risk − disclose credit ratings for investments in debt securities, whether held directly or indirectly including the credit ratings for positions in external investment pools. If a rating is not available, that fact should be disclosed. (This requirement does not apply to the debt securities of the U.S. government or obligations of the U.S. government agencies that are explicitly guaranteed by the U.S. government.) The city/county/district should use the various rating categories (e.g., AAA, Aaa, etc.) set by nationally recognized statistical rating organizations (e.g., Fitch Ratings, Moody’s Investor Services, Standard & Poor’s, etc.). Any assumption made in process of applying these methods need to be disclosed. Describe the highly sensitive investments. For additional information see the GASBS 40, paragraph 16 and 57 (examples listed were asset-backed securities) and Illustration 7. Illustration includes CMO’s, inverse variable rate notes, and variable coupon note with multiplier as examples of investments with fair values highly sensitive to interest rate changes. Governments that participate in a pooled arrangement (other than an external pools investment pool) should disclose interest rate risk for the pooling arrangement. This disclosure is limited to investments in debt mutual funds, external debt investment pools, or other pooled debt investments. Governments should also disclose any contractual terms for debt investments that expose those investments to the risk of significant changes in fair value resulting from interest rate fluctuation (e.g., coupon multipliers benchmark indices, embedded options, etc.). 4. Foreign currency risk − disclose the U.S. dollar value of any investments denominated in foreign currency, organized by each different foreign currency denomination and type of investment. any income from investments associated with one fund that is assigned to another fund. This is an internal investment pool that is utilized for the investment of the funds. Fund ownership is measured using the ___________ method. Under this method, each participating fund’s investment balance is determined on (explain basis for distribution). The investment strategy, including the selection of investment managers, is based on the directives of the (city/county/district’s treasurer or ). 6. Describe additional risks, if applicable. Governments should disclose policies relevant to each of different types of risks, but only for those types of risks actually faced by the government. If a government does not have a policy that covers one or more of the risks it is facing, that fact must be disclosed. For more information see GASB Statements 3, 28, 31, 40, 59 and 72. Governments with investments in mutual funds, external investment pools, or other pooled investments that do not meet the criteria established to report at amortized cost under the GASBS 79, should disclose interest rate risk information according to one of the methods. Investments should generally be reported at their fair value. 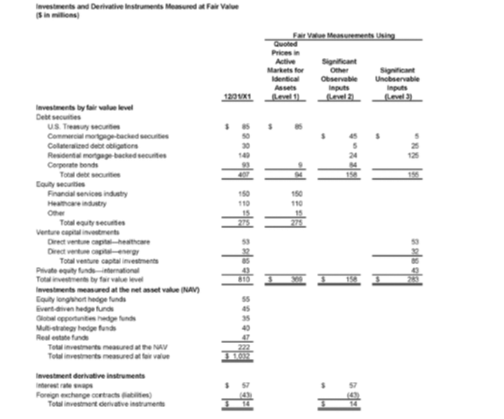 The following disclosures are required for assets and liabilities reported at fair value. Remove reference to liabilities if no liabilities are measured at fair value. If there are no such investments, this section should be deleted. For any significant changes in valuation techniques, the changes and the reason for making them. Disclosure is required for the reason for any nonrecurring measurements. Line items presented in the statement of net position. Investment held by external investment pools meeting requirements of GASB Statement 79, Certain External Investment Pools and Pool Participants (amortized cost). Money market investments and participating interest-earning investment contracts that have remaining maturity at time of purchase of one year or less provided that the fair value of those investments is not significantly affected by the impairment of the credit standing of the issuer or by other factors and are held by governments other than external investment pools (amortized cost). Investments in nonparticipating interest-earning investment contracts (cost-based measure). Investments in unallocated insurance contracts (should be reported as interest-earning investment contracts according to the provisions of GASB Statement 31 or Statement 59). Synthetic guaranteed investment contracts that are fully benefit-responsive (contract value). Investments in life insurance contracts that do not meet the definition of a life settlement contract (cash surrender value). Level 1 inputs are quoted (unadjusted) prices in active markets for identical assets or liabilities that the government can access at the measurement date. Observable markets include exchange markets, dealer markets, brokered markets and principal-to-principal markets. These are inputs other than quoted prices included within Level 1 that are observable for the asset or liability, either directly or indirectly. Inputs are derived from or corroborated by observable market data through correlation or by other means. Unobservable inputs for the asset or liability; only should be used when relevant Level 1 and 2 inputs are unavailable. Government may use their own data to develop unobservable inputs if there is no information available. The SSAP should indicate whether the government used this option and, if so, for which one specific categories of investment. Also, if a government uses some other than quoted market prices to estimate the fair values, the methods and significant assumptions should be disclosed. Note: Governments using a pricing service or custody bank for fair values will need closely review statement to ensure valuation changes are correctly reported. Determine what the source of the fair value information will be for each item. Do not simply rely on the fair value reported to you on monthly bank statement or brokerage statements. Contact the financial institution to understand how they determine fair value. If there are derivatives investments identified as hedging instruments, an additional disclosure is required per GASB Statement 53, Accounting and Financial Reporting for Derivative Instruments (amended by GASBS 64). A government can use NAV per share, as a practical expedient, for investments in nongovernmental entity that does not have a readily determinable fair value (also known as “alternative investments”). The NAV is not permitted for valuation if it is probable the government will sell the investment at a different price. 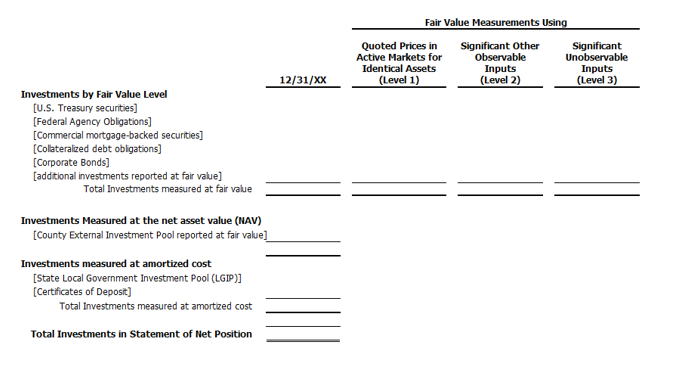 Investments measured at NAV would be excluded from the fair value hierarchy (Level 1, 2, or 3). Note: Investment pools containing language for NAV at fair value or amortized cost should be reported in accordance with other investments at fair value or amortized cost, and not as investments using NAV as a practical expedient. If a sale is planned but not all assets have been identified, the government’s plans to sell and any remaining actions required to complete the sale. Optional disclosure for cash and investments reconciliation. There is no requirement to reconcile the disclosures required for cash equivalents or deposits and investments to the statement of cash flows or to the statement of net position/balance sheet. Many of the deposits and investments that are subject to disclosure requirements may be reported in the statement of net position/balance sheet as cash and cash equivalents. Other may be reported in the statement of net position/balance sheet using titles that do not identify their nature as deposits and investments. Disclosure of such reconciliation can provide useful information to the users of the financials. the amount of any losses on the securities lending transactions during the period resulting from the default of a borrower or lending agent and amounts recovered from prior period losses, if not separately disclosed in the operating statement. Securities lending transactions are subject to custodial risk disclosure requirements addressed in paragraph 9 of GASB Statement 40, Deposits and Investments Risk Disclosures. See paragraph 10 of the above statement for applicability of this disclosure. a. The calculation of realized gains and losses is independent of a calculation of the net change in the fair value of investments. b. Realized gains and losses on investments that had been held in more than one fiscal year and sold in the current year were included as a change in the fair value of investments reported in the prior year(s) and the current year. For more details, see the GASB Statement 31, Accounting and Financial Reporting for Certain Investments and for External Investments Pools, as amended by the GASB Statement 40, Deposits and Investments Risk Disclosures.